Gilmans Kitchens and Baths is a fully licensed contractor offering bathroom remodeling and design services in San Francisco, California. As our customer, you have the opportunity to work with our qualified bath designers as well as our entire Design-Build team. This provides you with the benefit of working with one company for all your bathroom remodeling needs, including the initial design, the products and materials and the installation services. If you have already hired an independent contractor for your bathroom remodel in San Francisco, you may still wish to visit one of our showrooms for fresh design ideas and product information. We can price out the appropriate cabinetry for any proposed design and offer our skilled craftsmen services for installation. The cost of your bathroom remodel can vary due to many factors. In fact, according to ImproveNet.com, most homeowners spend anywhere from $11,083 to $20,833 in San Francisco for a bathroom remodel, including contractors and materials. Materials: Your bathroom remodel cost will largely depend on your choice of bathroom materials. For example, a bathroom sink can range in price from $30 to $1500. We offer a broad selection of vanities to ensure you will be able to find something you love no matter your budget. Labor: The cost of labor can vary across bathroom remodel contractors, as well as projects, and it tends to be a significant factor in any remodel project. Gilmans will provide you with a free in-home estimate, including a complete and transparent view of our labor costs, to help you prepare your budget. Bathroom Size: The size of your bathroom will directly impact your remodel cost. Many materials, such as floor tile, are priced per square foot. Also, the larger the room, the more labor is required. If you’re considering enlarging your bathroom, make sure you have a good idea of the future size to share with your design and contractor services for pricing. Neighborhood: While your neighborhood shouldn’t directly impact the cost of your remodel, it can affect shipping costs for any products and materials, particularly if you live outside of the San Francisco area. Also, the neighborhood can affect the value a remodel adds to your home. If you’re planning a remodel to increase your house value, consider your neighborhood and market trends. Customizations: Any customizations will add to the cost of your remodel project. For example, prefabricated cabinets will cost a lot less than custom-made cabinets. While customization can make your bathroom unique, if you want to reduce your budget, you should keep them to a minimum. Budget: One of the best ways to keep your costs under control is to come up with a budget in advance and stick to it. Be aware that unexpected problems and costs can occur, so any budget should include a contingency. We recommend setting aside an extra 10% to make sure you’re covered for any unfortunate surprises. Trends: There are always home remodeling trends in the marketplace. If you are remodeling with the intent to sell your home, you should keep in mind what is popular in your area. If you’re not selling right away, you also need to make sure the trend is something you love and that will not likely change in the next year or two. After all, if you need to do a second remodel soon, due to a changing trend, this will have a significant impact to your long-term costs. Additional Costs: Depending on the scope and nature of your remodel, there may be extra costs such as permits. We encourage you to check with your city government, so you are aware of these costs in advance and can factor them into your budget. It’s natural to wonder: how much value does a bathroom remodel add to your home? 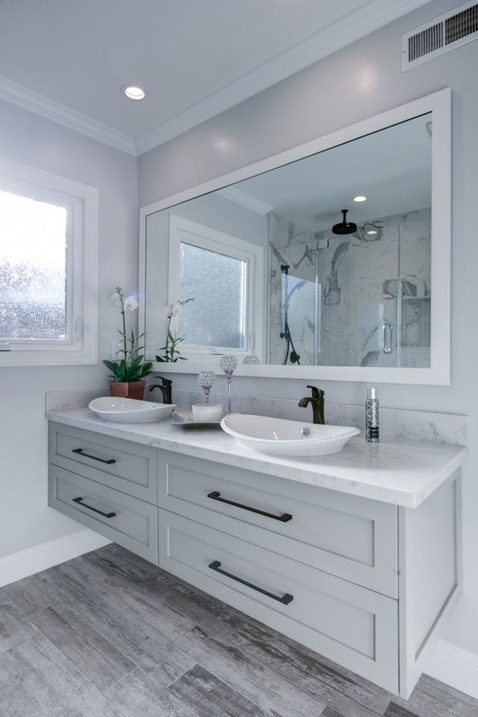 A full remodel, or even just a bathroom cabinet remodeling project for your San Francisco home, will often be appealing to home buyers, and it can certainly increase your San Francisco home value. However, it may not raise the value of your home by as much as you invested. According to the National Association of Realtors, new bathrooms return about 67% of their cost here in the West. Are you remodeling to increase your home value? Consider what is most attractive to prospective home buyers to get the most out of your investment. For example, full and three-quarter baths are generally more attractive than half-baths. Also, home buyers with children often want bathrooms with tubs as well as showers. This is the initial stage of the project where we work closely with you to identify and understand your goals and objectives for the remodel. We will take the time to get to know your lifestyle and preferences to ensure that our design is perfect for your home and family. Our professional crew will evaluate the current condition of your bathroom. Then, they will work with you to understand any special home requirements. If we see any potential issues that could impact the design plan, we will work with you to find a solution you’re happy with. At the end of this stage, we will present you with a detailed project scope and a comprehensive outline of the project budget. Our staff will answer any questions or concerns you have. We will not get the project underway until you have approved the details of your remodel. Once you have approved the project scope and budget, our design professionals will begin by creating a schematic design of your new proposed floor plan. We will share this with you and gain your approval before moving forward to make sure we’ve accurately captured your vision for the room. We will then walk through all of the important design elements with you, such as your bathroom cabinet design. Our experienced team will help you pick the perfect fixtures and finishes for your bathroom remodel. We will then create printed black and white 3D renderings and screen renderings to show you what the end project will look like. Once you approve the renderings, you will be provided will a copy of all the drafted construction documents. This includes all the technical specifications. 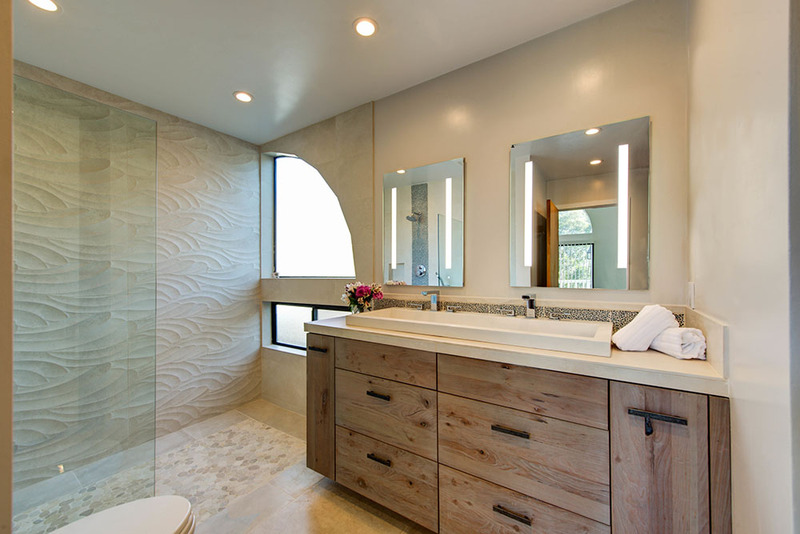 Once you’ve reviewed and accepted your bathroom remodel design plan, our crew of skilled laborers, craftsmen, and carpenters will begin to prep the site and prepare your bathroom and home for construction. The building phase will be the longest and most exciting phase of your project. It will include every aspect from demolition through to wrap up, final inspections, and approvals. Our in-house team will take care of everything from removing your old bathroom furniture to completing the new bathroom cabinet installation. If your remodel requires any city approvals, we also take care of that during this phase. At the end of construction, we will remove all our construction materials, clean-up the site and then complete a final walk-through of your new bathroom with you. Once we’re certain you’re happy with your finished bathroom, we will turn it back over to you, so you’re free to enjoy your brand new space. If you’re ready to start working with our design team, or if you simply want to learn more about our bathroom remodeling services, you can visit us at the showroom closest to you. We can show you some of our past designs as well as answer any questions you may have. Click here for the map and directions on how to reach us. You can also contact us today by phone or online to schedule an appointment to meet with a designer.